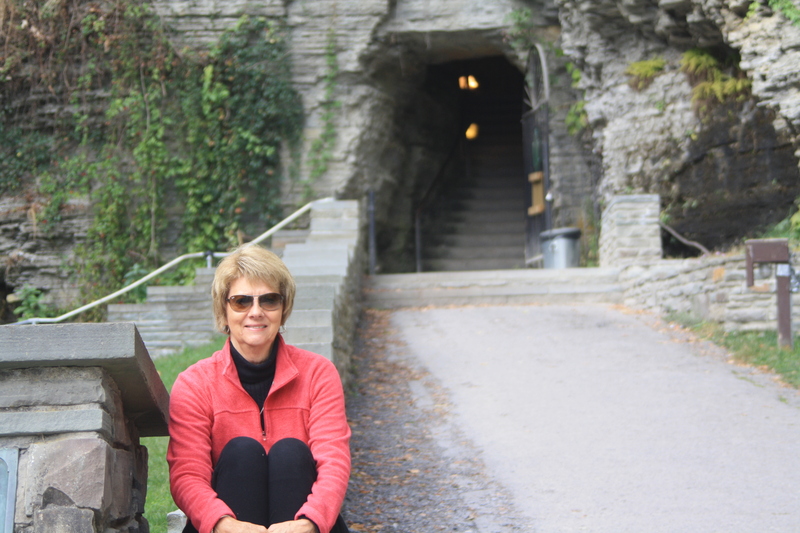 Watkins Glen State Park – Let's Go RVing! We tried to get an earlier start today so we left a little after 10; 00 headed to Watkins Glen State Park. To say that it is magnificent is such an understatement. We entered through a tunnel and then onto a bridge overlooking the parking lot and then – we began to see the first of 19 falls each prettier and just as glorious as the other. We even stood under one, rather I stood on the edge while Jerry took a picture and then quickly and carefully ran over the wet rocks. It was a mile and a half up but it was a very easy climb with a lot of steps but with flat surfaces for rest. All total it was over 800 steps, twice as many as Chimney Rock but it seemed to be easier. After the first mile many folks turned around as the view up top is nothing special but since we had gone that far we decided to go on up. The last half mile was a more difficult, steeper climb with many uneven steps. On the way up we were resting at one of the “seats” and a Viet Nam vet came down. He was carrying a walking cane and since I had been suggesting to Jerry that he get one Jerry asked about it. The fellow had made it himself. The stick had a symbol of every war that America had fought in plus the Cross and the American flag. Not only had he made the walking stick but he had also painted each symbol. Quite impressive. Getting to the top was an accomplishment but all we found was a restroom and a water fountain that didn’t work very well. Since it was after Labor Day the gift shop was closed and there was no shuttle down. We decided to take a different trail down so having taken the Gorge Trail up we went down the Indian Trail. I’m glad we didn’t go up the Indian Trail because not only was it dirt ad steep there were no waterfalls to see. It was kind of like a walk in the woods and could have been anywhere. The main reason we went was to go over the suspension bridge which I mistakenly thought was some sort of hanging bridge. Nope, it was just a bridge and the rails were so high you couldn’t see much over them. We kept walking and ended up near the tunnel and the descent down. Jerry took a picture of our car in the parking lot. We really were up high! 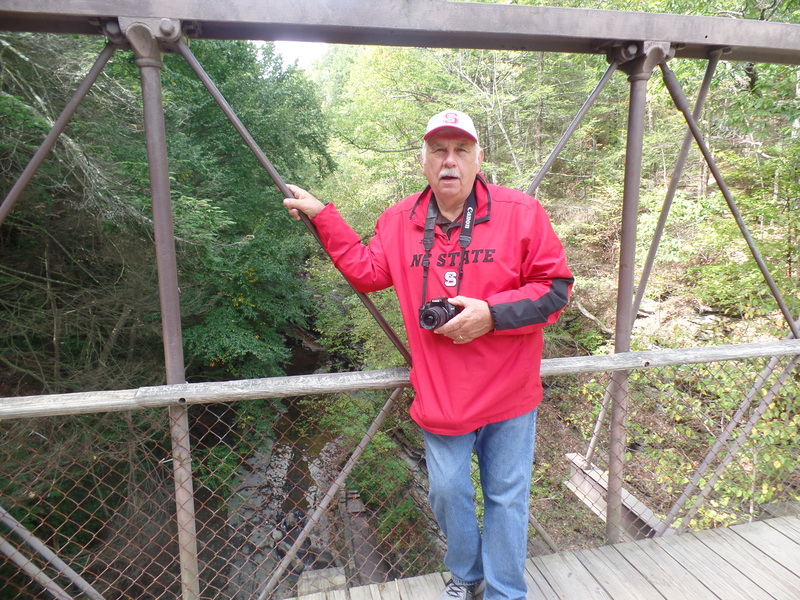 I know Letchworth State Park was voted the Best Park in 2015 and it was gorgeous but as Jerry said, we didn’t vote. 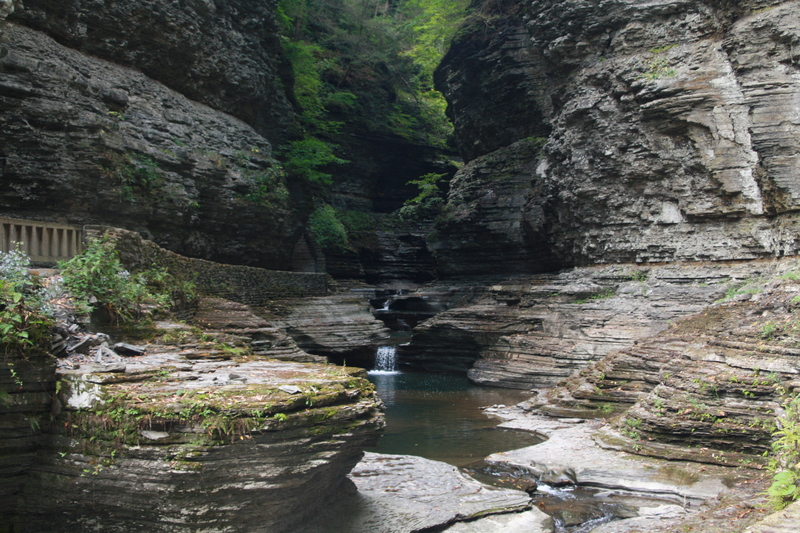 I could go back to Watkins Glen SP again immediately! After our hike we stopped at the gift shop and bought the customary magnet and then headed back to the campground for lunch. Since we had missed Arbor Hill Vineyard and Wohleschegel’s Naples Maple Farm we decided on a trip to Naples. Although the GPS said it was only 30 or so miles it would take an hour to get there. Why? Well, every six miles or so there is a small village and the speed limit drops thus the delay in timing. On the way we saw an Amish woman mowing the grass in her front yard with a push mower. Wow! Jerry was sleepy so I drove and he took a nap. It’s a wonder neither of us got a ticket entering the villages because we were often going downhill and keeping the speed down is difficult. We stopped by Arbor Hill Grapery first. Half of the shop is for jams and jellies and half is for wines. I bought some blush wine jelly that I sampled and then bought some Yancey’s Fancy cheese for Mary Ann. They also carried Lively Run Goat Cheese as well. We didn’t stay long as Jerry was not interested in a winery that called itself a grapery. We called to see if we could visit Wohleschlegel’s and they said to come on so we did telling them it would be about 25 minutes thinking we surely couldn’t trust the GPS and we’d get lost again. Nope, drove right there in short time. Garry and Bobbie couldn’t have been nicer. Bobbie was busy wrapping candy and bagging sugar maple syrup but Garry showed us around the facility and explained everything to us. It is definitely a mom and pop business and they are working extremely hard and constantly. They have 40000 trees with taps. Last year the season began March 11 and ended April 13. The length of the season depends on the weather and how cold it is and for how long. The days have to be above freezing and the nights not too much below. We bought some maple syrup. Jerry bought the very dark and I selected the very light. We also got some tasty mustard. We probably spent well over an hour there taking up their precious time but they were very gracious and couldn’t have been friendlier. They were very informative, not just about maple syrup but they also answered a number of questions we had about New York in general. As we were riding through Naples we stopped at a fairly large market featuring fruits, cheeses, pumpkins and Adirondack chairs. I could see Jerry’s mind working as he took pictures of the chairs. Surely he’ll eventually be trying to make one of these. We finally got back to the rig a little 7:00. Fortunately dinner was leftovers so all we had to do was heat it. We were planning to go to the pool and hot tub but we ended up chatting with a couple of guys right after we got back so we came on in, ate dinner and called it a night.